I spent most of today organising some storage in the basement of the new place, putting together some shelves I bought a few days ago. Good shelves, too—we bought one a year or so ago so we knew what we were getting. They’re metal, and each shelf can hold up to three hundred and fifty pounds. The only problem is that each shelf is basically made of wire, so to finish up I bought some quarter-inch sanded plywood to lay on top. That was all finished up just a little while ago, so now we have five racks ready to take stuff from the basement in the old place. Tomorrow I begin moving things over. In other house news, we bought some used furniture from a charity thrift store: a big hutch, an armoire, a chest of drawers, a dresser, a small cabinet and a two-seater sofa that was in such great shape that it was just too good to let pass. Most of the stuff is in the garage and once the flooring is in place on the ground floor we can move it into position. NOT as much as I hoped it would, but I managed a couple of hundred words on Gunn & Bohemia II—the most I’ve managed in the last few weeks, what with everything else going on. Going forward the plan is to reserve some writing time every day, even if it’s only half an hour. Some progress is much better than no progress at all; no progress makes me twitchy and irritable, and being able write even just a few dozen words makes a big difference. I also got a little bit of news from my publisher. A few weeks ago I sent them the first few thousand words from The Artemisia Chronicle, which is a full-length novel I wrote a while back and put to one side, to see if they might be interested. Well, it took a while because they’ve been really busy getting Terra Mechanica and then Tomorrow Wendell (a novel by RM Ridley) out of the door, but I got an email the other day saying they were interested. Next step on that is for me to fill in a submission form, which (with all the house and day job business going on) I haven’t had time to get to. Soon, though. SINCE the post about vaping a few weeks ago I’ve been continuing on with using the Vuse, with good results; I still get the urge to burn a real cigarette, especially when I’m feeling a bit stressed, but I’m averaging something like three real ones a day. Some days I’ll smoke four, and a couple of days I managed to get through with only two. And I’m very happy to report that last week I went one whole day without a single cigarette. I feel really good about that. Now, I would be remiss to write this without the shameless plug for the book. It’s available for Kindle, Nook, and in paperback (and keep an eye open for other formats such as Kobo). ONE question that came up during the party: What I want to know is how do you write such intriguing female characters? My answer to that is, I really just don’t know. It’s not something I give conscious thought to as I’m writing—I just write the characters’ actions and dialogue in a way that’s right for that person, in line with how I see them in my mind. But the question bugged me all day yesterday, and I got to thinking about it while I was working on the house. I think I might have an answer. I’ve never thought of women as being “like men, only less.” For me, women are “like men, but a bit different in some ways.” I think it’s daft not to acknowledge that men are, on average, physically stronger than women. And I don’t think it should be a surprise to anyone if I suggest that women think about things in a different way. Not a wrong way, or an inferior way—just different. I suspect that’s a biological difference. And women—on average—tend to be more expressive when it comes to emotions. In my view, men can be just as emotional, but we tend to keep things inside more, the result being that women might seem weak in that regard, in the same way that men who wear their hearts on their sleeves often seem weak to the macho men. I tend to think this is more from cultural pressures than biological imperatives. The point is, I don’t think of women as property, or skivvies, or as some kind of appendage dependent on men. Psychologically, mentally, women are in general at least as strong as men. They can be just as determined, just as assertive, and more. And that, I think, comes across when I write the words and actions and thoughts of my female characters. Is that the answer? I don’t know for certain, but I do know I’ll continue to write my characters—male and female—in the same way, because honestly I don’t know any other way to write them. I’d have a hard time writing female characters that had no substance to them, mere shadows cast by the light of men, dependent and submissive. Some of my readers might be old enough to remember a certain series of science-fiction/fantasy books that began in the sixties and is still, unfortunately, going strong; books that objectify women and portray them as enjoying or even needing to be treated that way. I made the mistake of reading one once. I’m not about to mention it by name because while I’m not in favour of censorship, I think misogynistic tripe like that should be marginalised and forgotten in this, the twenty-first century. I can’t imagine myself writing anything like that. THINGS are coming on, if slowly. We can’t begin moving our stuff in until the floors are done (we’re having the carpet in the living room replaced with hardwood, and getting new carpet in a couple of the other rooms because what’s there is pretty old). In the meantime I took most of last week off so that I could do some other work—painting the garage and porch, fixing door handles and locks, cleaning the carpet in the basement rooms, and a bunch of other little things. I have shelves to put up in the basement, and I’ll be doing some of that this evening (and mowing the grass again). Once that’s done we can begin moving some things in; stuff we don’t use often, that’s currently in the basement in the old place. Then, at last, it’ll begin to feel as if we’re making some real progress. Terra Mechanica Release Only 90 Minutes From Now! It’s not too late to sign up, or in fact you can just show up! The party’s on Facebook, and you’ll find it HERE. Meet the authors! Prizes! 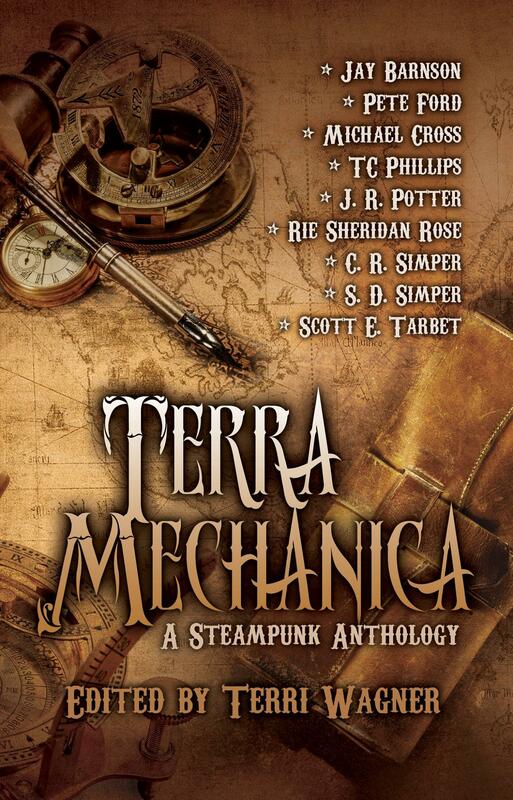 In the run-up to the release of Terra Mechanica: A Steampunk Anthology—coming to e-book and print outlets on May 31—the authors of the nine short stories in the collection have written blog posts about their work. You can read them all on the Xchyler Publishing blog, HERE. In the run-up to the release of Terra Mechanica: A Steampunk Anthology—coming to e-book and print outlets on May 31—the authors of the nine short stories in the collection are frantically writing posts for your edification and delight. Our ninth and last author is S. D. Simper, who gives us a some background to her story Priority Passage, and tells us a little about her writing process. Read all about it HERE. And don’t forget, gentle reader: the release party for Terra Mechanica is happening on Facebook TONIGHT! Go HERE right now and sign up!